The Point Atkinson Lighthouse may be reached by hiking the Valley Trail in Lighthouse Park. ^ Rowlett, Russ. 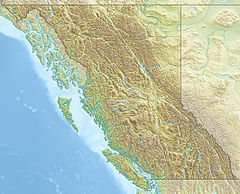 "Lighthouses of British Columbia". The Lighthouse Directory. University of North Carolina at Chapel Hill. Retrieved December 27, 2015. ^ "Point Atkinson Lighthouse National Historic Site of Canada". HistoricPlaces. Parks Canada. Retrieved 4 March 2015. Wikimedia Commons has media related to Point Atkinson Lighthouse. This British Columbia lighthouse-related article is a stub. You can help Wikipedia by expanding it. This page was last edited on 10 January 2019, at 10:14 (UTC).